Based on these experiences the first day of the congress is about relocation and reuses in the context of participation. In three different blocks, experts will speak along the following questions: How do intermediate, conversion and reused sites meet the users´ needs? Are temporary uses suitable as starting points for participation processes? Why are they often limited to places in problem situations? What opportunities offer interim uses for a more sustainable management of the inventory property and the city? The second day focuses the venue. We start with an Urban Walk through the former wool combing works (BWK). Afterwards different experts give examples for various reused industrial sites. Finally we gather new options for the building in the workshop. The workshop is based on the temporary use of the building as the “Palace of Production” and the findings of the accompanying “desire production”. The two-day congress will take place in the “Palace of production”, a former wool combing works (BWK). The address is Landrat-Christians-Strasse 95, 28779 Bremen-Blumenthal. The Palace of the Production is designed by the ZZZ as a temporary laboratory for testing new ways of working and production methods. The project invites all kind of people to artistic and practical approaches to work, on a vacant place of the industrial age. 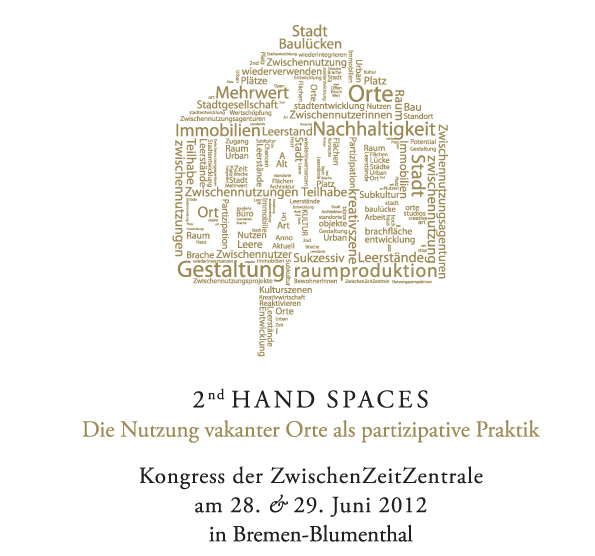 The congress will be in German, except the lecture by Massimo Bricocoli. If you would like a translation into English, please contact us early. Massimo Bricocoli (*1967) PhD in Urban and Regional Planning, assistant professor at the Politecnico di Milano. Focuses of research: Urban planning and social Policy, neighborhood programs, and savety policies. 2009–2010: Grant recipient from the Alexander-von-Humboldt-Stiftung at HaferCity University Hamburg. Franz-Joseph Höing (*1966) studied spatial planning in Dortmund and worked in Vienna, Hamburg and Aachen, where he led the “Project Group Port City.” As a professor of urban planning, he taught at the Münster School of Architecture. He was appointed to the Senate Building Director to Bremen in 2008. 2012 he was elected to the councilor for planning and building of Cologne. Andreas Krauth (*1983) studied Architecture at the TU in Munich and Berlin University of the Arts. He is working with Sophie Wolfrum at the Chair for Urban Design and Regional Planning, among other things on the exhibition Multiple City at the Pinakothek der Moderne and its accompanying catalogue. He graduated in 2010 with a thesis on processual urban development in Red Hook (Brooklyn, NY). Sarah Oßwald (*1978) has a degree in Geography. She studied in Frankfurt am Main and Berlin, and since 2005 she has been pursuing the issue of temporary use in theory and practice. She is the initiator and co-operator of the Tentstation campsite in Berlin. She has contributed to the ZwischenZeitZentrale Bremen since 2009. Klaus Ronneberger (*1950) studied social pedagogy, cultural studies and sociology. He was a long time employee of the Institute for Social Research in Frankfurt. Today he works as a freelance journalist. He is a member of the Urban Research Group “spacelab”. Prof. Dr.-Ing. Holger Schmidt (*1959) studied at the Bauhaus University in Weimar in the Department of City Planning, where he defended his doctoral thesis in fall 1989. After that, he spent ten years at the Bauhaus foundation in Dessau as permanent conductor of the Academy and as a research assistant. In 2000 he left the foundation on his own request and started a free office for urban renewal and urban redevelopment. He has plenty of practical experience and has realized a number of innovative urban redevelopment projects successfully. Since 2009 he is professor of urban redevelopment and renewal at the University of Kaiserslautern. Stephan Willinger (*1965) studied spatial planning and urban sociology at the University of Dortmund, Berlin, Vienna and Aix-en-Provence. Since 2002 he has worked at the Federal Institute of Urban Affairs and Spatial Development as a project manager of the National Urban Development Policy and research of various fields to new planning concepts. Michael Ziehl (*1980) lives in Hamburg and is a graduate engineer in the field of Architecture. In 2007 he entered the masters program for Urban Planning at the HCU Hamburg. His work focuses on temporary uses and participative urban development. Besides various project-related activities, he is also the co-operator of the ZwischenZeitZentrale Bremen, cofounder of the initiative “Komm in die Gänge” in Hamburg, founding and supervisory board member of the Gängeviertel Genossenschaft 2010 eG, and co-initiator of Leerstandsmelder.de.